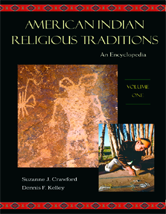 Editor/Author Crawford, Suzanne J. and Kelley, Dennis F.
Taking a deep and informed look specifically at the religious and spiritual nature of Native Americans, the encyclopedia places traditions within their historical and theoretical context, examining their relevance within Native religious life and practice as well as within the academic study of religion. Contributors include noted scholars of American Indian religious culture, including many who come from tribal traditions and can offer valuable insights and observations from their personal experience. Includes maps and further reading.